This Proline Classic Teflon Pool Table Felt comes in an Electric BluE color and is pre-cut for a 9 foot pool table. The felt set will include enough fabric to upholster the play surface of the pool table as well as the rails. 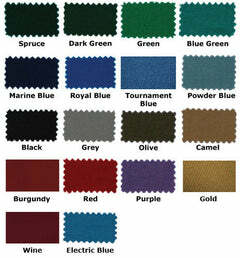 Proline is our most popular non-worsted cloth. The special teflon coating makes this cloth highly stain resistant by repelling liquids and stains. It is manufactured with an 80/20 wool to nylon blend which offers the perfect combination of stretch and durability. Proline weighs between 20-21 oz and has 30 color options. You also have the option of upgrading to the two-tone bed and rails for an additional $15. You just can't wrong with Proline Classic for your 9 foot pool table.